Kielbasa is a popular ingredient in many recipes. It is often used in recipes based on dishes from Eastern Europe, but is adaptable to many cuisines. 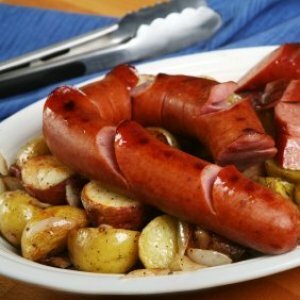 This page contains recipes using kielbasa or Polish sausage. Saute Polish sausage in skillet. When heated or browned, add frozen vegetables and stir until softened. Add about 1/4 cup of the Teriyaki Baste and Glaze, more or less to taste. Stir well and serve over rice or as is. Everyone will love this and beg for more! This cooks fast so be watchful! Editor's Note: Some of the ThriftyFun crew tried this recipe. It was wonderful, even passing the taste test of a 4 and 6 year old! We made a few slight modifications of the recipe on our 2nd attempt. We used 1/2 a Hillshire Farms Turkey Kielbasa and sauted onions along with the sausage. We also added 2 Tbs. of water as it was cooking to provide a little more liquid when it was served over rice. The pictures provided are from when we made this dish! In a large pot, place the cubed potatoes, cabbage, carrots, and add enough water until everything in the pot is covered. Cook over medium heat for about 45 minutes. Add the kielbasa and cook for an additional 15 minutes. Add salt, pepper, and butter to taste. This is an easy weeknight meal that my whole family likes. It is inspired by a recipe of my mother's. Combine the 3 sauces together into a crock pot. Add kielbasa and mix. Cook on high for 90 minutes. My parents and I really enjoy kielbasa. We have very limited ways of preparing it. Normally we fry or grill them and eat them on hotdog buns or bagels. We would really appreciate any casserole dishes or other ways to prepare this meat. We looked in a couple cook books with no success what so ever. I love to chop mine up and add it with chunks of pineapple to a package of red beans and rice. Dirty rice is also really good. Zateran's is my favorite brand, but any of them will work. If the beans and spices give you any trouble, put in about 1 T. of sugar once everything is done. It takes the kick out of tomato products, and helps to neutralize the beans and spices. Here is a recipe I posted a few years ago. It's my mom's recipe and we make it often. I cut the sausage up into 2 inch pieces, put in casserole dish, along with 2 cans of new potatoes (pour in 1/2 to juice from can), parsley, minced onion and pepper to taste. Cover and bake at 350 F for about 30 minutes. I like to cut it up and put it in a pot with potatoes and onions and green beans and season with salt and other thing a little broth or water and cook on stove top. Try frying with cabbage and some onion flakes or chopped green onions. This is one of my favorites from the Better Homes and Garden Cookbook. 2 medium cooking apples, cored and sliced. In 12 in skillet cook onion in hot margarine or butter till tender. Add cabbage wedges. Stir together apple juice, brown sugar, and vinegar. Pour over cabbage in skillet. Bring to boiling. Reduce heat Simmer, covered, for 15 minutes. Add kielbasa and apples. Return to boiling. Reduce heat and simmer covered, for 10 minutes or till sausage is hot and apple is crisp tender. Serve with slotted spoon. Makes 4 servings. Note: I have used apple cider instead of apple juice and I have used smoked kielbasa also. I am looking for a bean recipe. If I were to name this recipe, I would call it ranch style beans, but not like the canned ranch style beans. These are slow cooked and have some sort of kielbasa sausage in them. (No other chunks that I could tell... haha) Wonderful flavor. I don't like most of the canned baked bean and related beans but we had these at a catored event recently and they were marvelous! Does anyone have anything similar? I have eight baked bean recipes,none with Keilbasa.This one has Pastrami. Do you suppose we could substitute? or until hot and bubbly. In the south (NC) we take a can of pork n beans, (or true ranch style beans) cut up alot of onion in them, slice up a beef kielbasa and add "only a cap full" off of a LIQUID SMOKE bottle. ("It" is found at your local grocery store in the seasonings department). Put in microwavable bowl, cover with saran wrap and nuke for 15 to 20 minutes depending on how strong you microwave is. OR bake at 350 for 30 minutes. It is the Liquid Smoke that gives it the great flavor WE THINK! GOOD LUCK AND HAPPY EATING! 1 lb browned sausage pieces. heat through. if you like less soupy/saucy cook till they are the consistancy you like. thanks, i will try these, if anyone has any others, i would love to try them! I've been trying to find a recipe for kielbasa made with Coca Cola. I've never tried this, but what I would do: brown the sausages in a small amount of butter. Then just toss them in with a couple of cans of coke, simmering. I cook most of my stuff with either beer or wine, but I expect coke would work pretty well with Kielbasa. I'd probably add a couple of shots of rum to the coke. Intresting idea, I'll have to play with this one a bit. My son gave me some kielbasa, the Polish sausage. I would like some recipes for its use, but not too heavy. Does one boil it, saute it, broil it? Help! I saute in skillet using water instead of oil ( to reduce the fat) for 2 minutes then drain on paper towels. I then use hash brown potatoes and add a side of vegetables and make it a meal. This is a guide about kielbasa and fried potatoes. 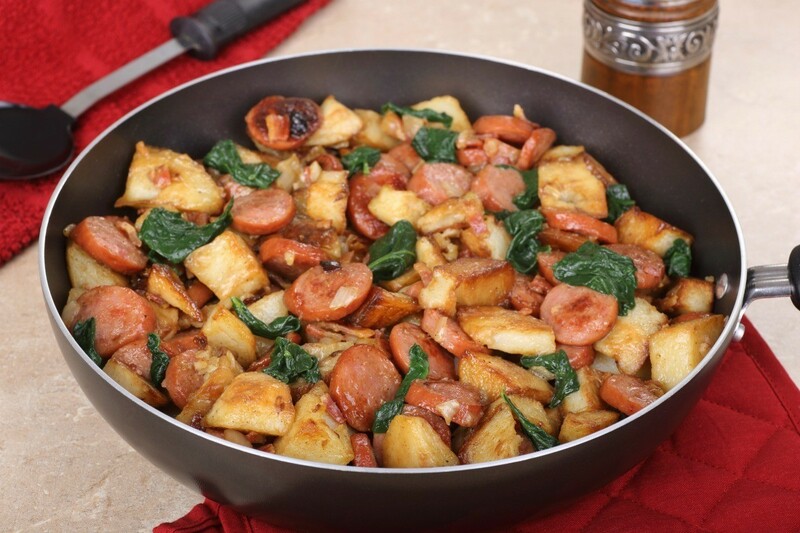 Kielbasa and potatoes combine to make a delicious meal. If the sausage is pre cooked, slice and use in the recipes below. If the sausage is fresh (uncooked), saute or boil first. If you are not a cabbage/sauerkraut fan, you can eliminate these from the recipes. Start large pot of water boiling. Add potatoes and carrots, simmer about 10 - 15 minutes, until soft, but not done. Add kielbasa, and simmer 5 minutes more. Add cabbage and simmer 5 minutes more until cabbage is done to your taste. Serve with mustard sauce and catsup. Mix mustard with mayo to you taste. Mix the soup and milk in a bowl. Place all other ingredients in greased/cooking sprayed casserole dish. Pour soup mix over ingredients, mix well to coat everything. I love it with fried potatoes and onions. Cut meat, potatoes, and onions into small cubes and fry up together. It is so good. Here is a crockpot recipe that we love. 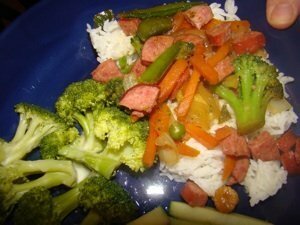 My mom used to slice some onion, zucchini, and various other veggies with the kielbasa to make a nice stir-fry with some rice. A lady just gave me this recipe and she says its great. I am going to try it soon. In a nonstick skillet, saute kielbasa over medium heat until lightly browned. vegetables are tender. Transfer to a crock pot/slow cooker. Oh, we just love kielbasa sausage. In the summer we slice it in half and grill it. We also make a Low Country Boil. In a large pot fill with water add Old Bay and bring to a boil, add potatoes allow to come back to a boil and cook for 15 minutes, add the corn bring to a boil and cook for 10 minutes, add the sausage bring to a boil again and add shrimp. Make sure the water covers everything, everything is done when the shrimp turn pink. Dump on to a large platter or on newspaper on a picnic table in the backyard during warm weather. Enjoy and you don't have a lot of dishes to clean. This usually feeds 4 hearty eaters. I serve it with some homemade bread and an assortment of cold drinks, sodas and sweet iced tea. When I was a bride, my husband was in the Navy, stationed in Plainville, Connecticut. I am from Georgia and had never been up north. We were there for two years and I love Connecticut. We haven't visited since 1985. You live in a beautiful place! My husband was attached to a reserve center in Hartford, The reserve center moved to Plainville while we were there. We loved to visit Gillett Castle, Devil's Hop Yard State park, Old Lyme, and many other great places. I love all the fall colors. We had a favorite Greek pizza place we loved to eat at, Georges. I have never had pizza as good as that. I have some great memories from your state! I slice it up and cook it in a big pot on the stovetop with water, instant rice, frozen peas, one can of cream of celery soup, one can of cheese soup and a small can of mushrooms. It makes for one quick and delicious dinner. I use Kielbasa in potato soup. Cook up some potatoes, slice some carrots and cook in a cup of chicken broth. Mash the potatoes and add milk to the consistency you like. I slice up the sausage and fry it (you don't have to do this step, but it adds flavor). Add cooked carrots, sausage, mashed potatoes, chicken broth and milk all together. Season as you like, salt, pepper, parsley, whatever. This is how I love to cook my kielbasa. Serve with buttered noodles and your favorite vegetable. Brown kielbasa and onions in bottom of good sized stock pot. Add cabbage (chopped up), squash (sliced), and bag of carrots. Add about 1 cup of chicken broth and the water, and stew for about 45 minutes (on low heat). Start by adding a tbsp of oil to a large skillet or pot. Add potatoes and onion; sprinkle with a little salt and pepper, cooking until potatoes are almost cooked through. 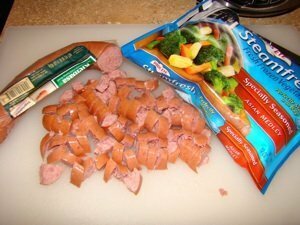 Add Kielbasa and broccoli or cabbage mixing all ingredients together. Cook until sausage has been browned and vegetables are cooked enough for your liking. Serve Kielbasa mixture and refried beans burrito style or just use the tortillas on the side. Slice the kielbasa in round circles. Slice up some peppers (green, yellow, and red), some mushrooms, and some garlic. Brown the Kielbasa in olive oil, then add the vegetables, and saute. When it's almost ready, add 2 Tbsp. of lemon juice, stir in and lower flame to make a light sauce. Cook some bowtie pasta, and serve over it. I love it sliced down the center and grilled, I serve it with sauerkraut mashed potatoes, and green beans, or broccoli cheese rice and green beans. Melt 2 tbsp. butter in a sauce pan and about 1/2 medium onion chopped, add 1 can sauerkraut and 1/2 cup of water. Simmer covered for 30 minutes until water is evaporated. Make mashed potatoes as normal and then add the sauerkraut to the potatoes, mmm delish! It is even better the second day! Preheat oven to 350*F, cut kielbasa into bite sized pieces, I usually do half circles. Pour cans of tomato sauce into baking pan and add kielbasa. Stir in curry till desired taste. Bake in oven for 20 minutes. Sprinkle cheese over top and place back into oven till cheese is melted. Serve with salad and garlic bread. Yummy!! This recipe is great. I think my mother found it on a package of Hillshire Farms kielbasa years ago. Today I prepare it this way for my own family. Enjoy! 1/2 c preserves (since my husband is a diabetic, I use sugar free preserves (mainly apricot), but any flavor will work. add it to the pan with sausage and veggies. Now add the pineapple and the juice from the can and stir. Now taste! Cover and simmer for about 10 minutes on low -medium. Serve over hot white rice. This recipe using Kielbasa or smoked sausage or Polish is awesome.